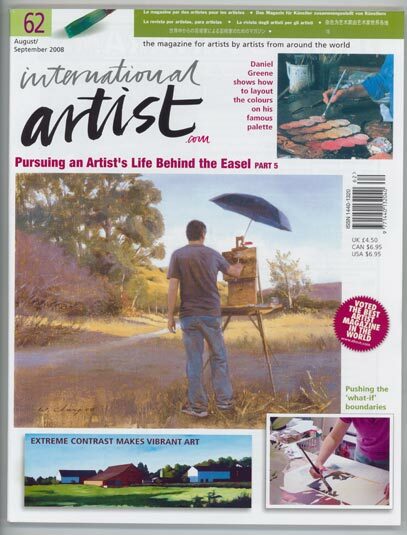 In Issue 62 (Aug/Sep2008) of International Artist Magazine, my painting, ‘Marula Shade’ was featured in a double page spread after being selected as a finalist in the ‘Favourite Subjects’ category. I was asked to write a little about the painting for the magazine, which I have reproduced below. I would like to thank International Artist for their support as this achievement has been a long-held ambition of mine, and I’m very proud to be associated with my favourite publication. The original painting of ‘Marula Shade’ is available to buy, please visit my online Shop if interested. I have always enjoyed painting the equine form, and, as I like to stretch myself from time to time, one of the things on my ‘to do’ list was to attempt the challenge of tackling a zebra picture. My project took me to a safari park, where I found several of the striped beauties dozing in the shade from the midday sun. Perfect! There are a number of different species of zebra (these are Chapman’s); each one’s markings are unique to that individual, and I found it interesting that the patterns so closely resemble those of human fingerprints. Working with such a strongly defined configuration of lights and darks offered so many exciting possibilities, and I explored these with small sketches to help me plan my approach. I settled upon this arrangement of three animals overlapping, which allowed the striped markings to merge almost to the point of confusion, but contains enough clues to retain each individual form as a separate entity. I kept the background very simple to avoid disrupting the arrangement of line, but used it as an opportunity to introduce some colour with the aim of creating a sense of the day’s humidity. Originally, the completed painting showed the entire animals, legs and all, but I felt the image was cluttered, and ended up cropping the painting to the long rectangle, which I felt resulted in a more powerful composition. Using Fisher 400 sanded paper, I made a light sketch in pencil followed by charcoal to define the stripes. I applied the background with soft pastels, blending first with latex-gloved fingers and then with a large flat silicon blending tool. 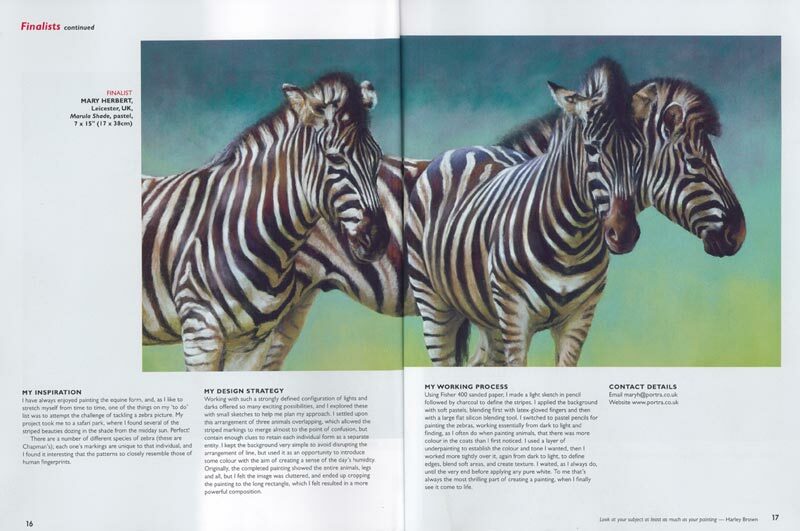 I switched to pastel pencils for painting the zebras, working essentially from dark to light and finding, as I often do when painting animals, that there was more colour in the coats than I first noticed. I used a layer of underpainting to establish the colour and tone I wanted, then I worked more tightly over it, again from dark to light, to define edges, blend soft areas, and create texture. I waited, as I always do, until the very end before applying any pure white. To me that’s always the most thrilling part of creating a painting, when I finally see it come to life.